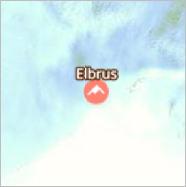 Small items that don't display at a given map scale or display as placemarks are places. For example, wells, ATMs, springs, fountains, etc. These map items are represented on the map as icons (pictographs) that differ in shape, color, size, etc. 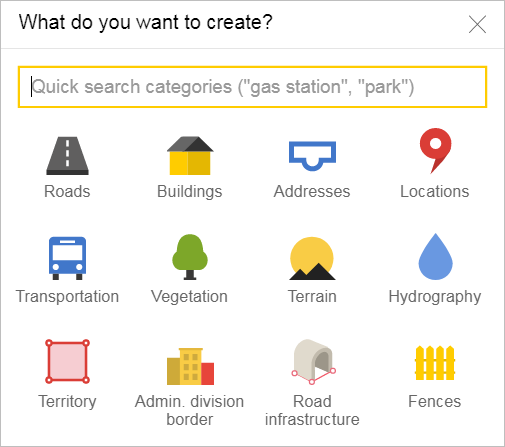 Additionally, map items that would make reading the map difficult if they were represented as polygons and whose shape itself is an insignificant consideration are drawn as places on Yandex Map Editor. Stores and institutions are examples of such items. Several such map items can be located within one building; using icons to represent them makes it possible to display them all without one overlapping another. Polygonal items whose borders can not be distinguished can also be drawn as places if, for example, the satellite image lacks sufficient detail (see section 2.3.1. Satellite images. You can draw these items as places and then re-draw them as polygonal items once the image has been updated and includes more detail. There are general drawing techniques that are used to draw places of various categories. 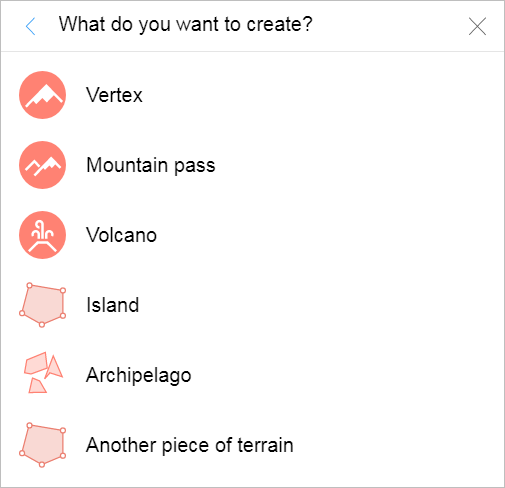 Click on the appropriate item category (for example Terrain ). 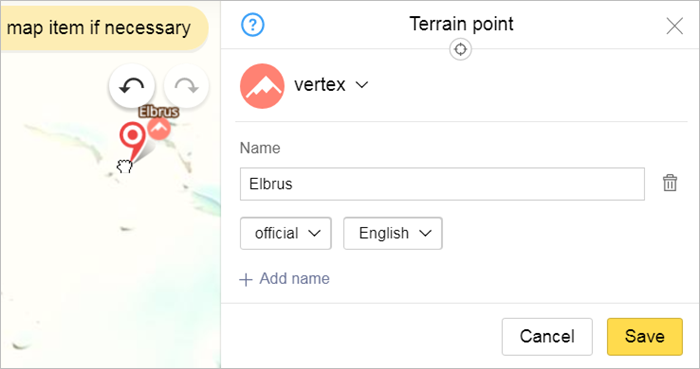 Click on the appropriate sub-category (type) of item (for example, Vertex ). Places should not overlap one another (even at very large/detailed scales) since this makes it hard to display and edit items. For example, address points shouldn't overlap with places (organizations). Fill out the fields in the attribute panel to add attributes to the item. Click Save on the attribute panel. Change the item's attribute values. Undo edits to the item. Click Edit in the panel. The item and attribute panel will switch to editing mode: To edit an item's attributes, enter the new values in the fields on the panel (for more information on adding attributes, see section 3.1. General rules). 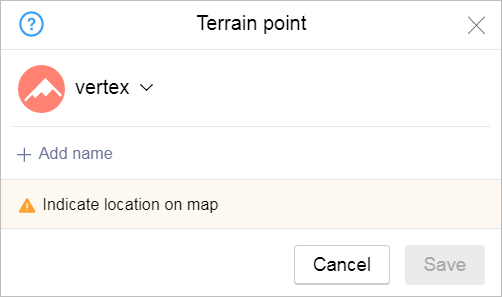 To save a map item you edited, click Save on the attribute panel. You can also copy places. Additionally, you can undo edits to places and send a report about the earlier edit to the moderator. These operations are used to delete map items.